Lately I've been learning how much easier it is for gay women and single moms to "come out" these days than it is for a single woman who's never been married and never had kids? Why is that? I know we're not supposed to judge, but these days this world is just @ss backwards! I spent half my life making sure I didn't get pregnant before ever getting married -- or knocked up in high school. Yet, now I'm the one whose the outcast? Seriously wtf??!!! Two wrong judgments don't make a right! I just hope to God I can find a few women like me to hang out with -- only ones that are not going to feel sorry for ourselves or let other people feel sorry for us. It's just so ridiculous! 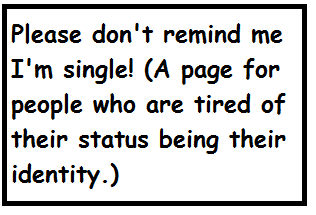 Seriously people, live and let live and stop trying to set up single women who just want to be left alone. If they ever meet someone who they want to marry, great but don't put them in some awful category as if they're all losers and washed-out people! Grow up people!